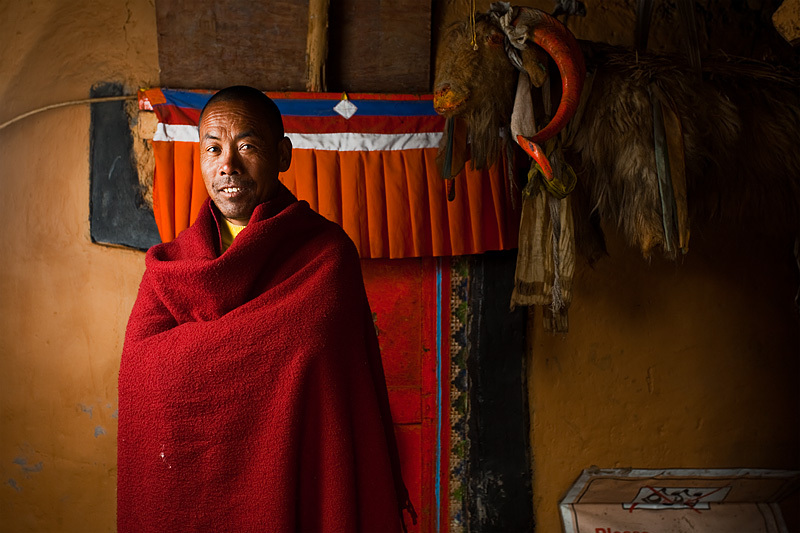 A Buddhist monk stands in a small monastery's courtyard inside the temple complex of Dhankar. When temperatures are near 0°C, it tends to be easier to carry around all my camera lighting gear, as it was in Dhankar. The sweaty discomfort associated with tropical heat and 30 pounds of camera gear disappear with temperatures found at 2+ miles elevation. Goodbye, sweaty back and shoulders; hello labored breathing and altitude headaches from the lack of oxygen. Our monk friend was in the process of locking up the monastery but was gracious enough to allow me to set up and snap a few photos of him (along with another monk - coming tomorrow). Strobist: umbrella diffuser, 45° off-camera left.